O God, by whom we are redeemed and receive adoption, look graciously upon your beloved sons and daughters, that those who believe in Christ may receive true freedom and an everlasting inheritance. Through our Lord Jesus Christ, your Son, who lives and reigns with you in the unity of the Holy Spirit, one God, for ever and ever. According to tradition today is the feast of St. Regina (Reine) who after undergoing many cruel torments, was beheaded for the faith at Aliza, formerly a large town called Alexia, famous for the siege which Caesar laid to it, now a small village in the diocese of Autun in Burgundy. 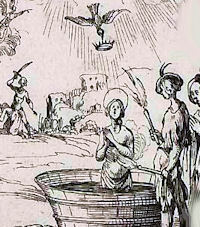 Her martyrdom happened in the persecution of Decius, in 251, or under Maximian Herecleus in 286, as some Martyrologies mention. She is honored in many ancient Martyrologies. Her relics are kept with great devotion in the neighboring abbey of Flavigni, a league distant, whither they were translated in 864, and where they have been rendered famous by miracles and pilgrimages, of which a history is published by two monks of that abbey. — Butler's "Lives of the Saints"
Historically today is the feast of St. Cloud a grandson of King Clovis of the Franks and the youngest son of King Clodomir of Orleans. He and his brothers were raised by their grandmother St. Clotilda, Queen of the Franks. Two of his brothers, Theodoald and Gunther, were slain at the ages of ten and nine by their uncle Clotaire, king of the Franks from 558-561. Clodoald survived by being sent to Provence, France. There he became a hermit and a disciple of St. Severinus. He remained at Nogent, near Paris, which became known as Saint-Cloud. The life of this saint is shrouded in obscurity; all that we know about her is found in the acts of her martyrdom which are considered rather unreliable in their details. She was born in the 3rd century in Alise, the ancient Alesia where two hundred years earlier Vercingetorix had fought so valiantly against Caesar. Her mother died at her birth, and her father, a prominent pagan citizen, entrusted the child to a Christian nurse who baptized her. When he learned of this fact, the father flew into a rage and repudiated his own daughter. Regina then went to live with her nurse who possessed little means. The girl helped out by tending sheep, where she communed with God in prayer and meditated on the lives of the saints. In 251, at the age of fifteen, she attracted the eye of a man called Olybrius, the prefect of Gaul, who determined to have her as his wife. He sent for the girl and discovered that she was of noble race and of the Christian Faith. Chagrined, he attempted to have her deny her faith, but the saintly maiden resolutely refused and also spurned his proposal of marriage. Thereupon, Olybrius had her thrown into prison. Regina remained incarcerated, chained to the wall, while Olybrius went to ward off the incursions of the barbarians. On his return, he found the saint even more determined to preserve her vow of virginity and to refuse to sacrifice to idols. In a rage, he had recourse to whippings, scorchings, burning pincers, and iron combs - all to no avail as the grace of God sustained the saint. All the while, she continued to praise God and defy Olybrius. In the end, her throat was severed and she went forth to meet her heavenly Bridegroom. Patron: Depicted as experiencing the torments of martyrdom; or as receiving spiritual consolation in prison by a vision of a dove on a luminous cross. Symbols: Against poverty, impoverishment, shepherdesses, torture victims. 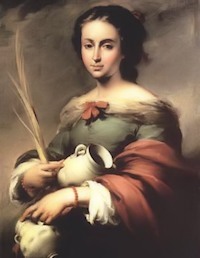 Visit this website to learn more about St. Regina. St. Cloud is the first and most illustrious Saint among the princes of the royal family of the first race in France. He was son of Chlodomir, King of Orleans, the eldest son of St. Clotilda, and was born in 522. He was scarce three years old when his father was killed in Burgundy; but his grandmother Clotilda brought up him and his two brothers at Paris, and loved them extremely. Their ambitious uncles divided the kingdom of Orleans between them, and stabbed with their own hands two of their nephews. Cloud, by a special providence, was saved from the massacre, and, renouncing the world, devoted himself to the service of God in a monastic state. After a time he put himself under the discipline of St. Severinus, a holy recluse who lived near Paris, from whose hands he received the monastic habit. Wishing to live unknown to the world, he withdrew secretly into Provence, but his hermitage being made public, he returned to Paris, and was received with the greatest joy imaginable. 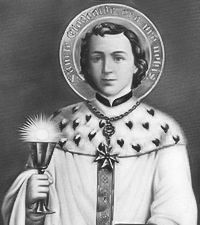 At the earnest request of the people, he was ordained priest by Eusebius, Bishop of Paris, in 551, and served that Church some time in the functions of the sacred ministry. He afterward retired to St. Cloud, two leagues below Paris, where he built a monastery. Here he assembled many pious men, who fled out of the world for fear of losing their souls in it. St. Cloud was regarded by them as their superior, and he animated them to all virtue both by word and example. He was indefatigable in instructing and exhorting the people of the neighboring country, and piously ended his days about the year 560.